Do or do not. 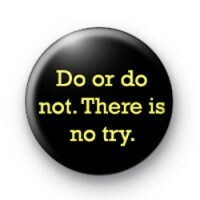 There is no try quote badge from the star wars movies in Black & yellow. This famous Yoda quote badge is popular with our many star wars fan customers and we have a good range of star wars inspired button badges to choose from. If you are a fan of Yoda & the Jedi & love Luke Skywalker and the rebels, make sure you have a look through our movie badge section. We have badges for all tastes. 25mm button badge made by hand in our workshop and available for delivery anywhere in the world.